From just after Valentine’s Day to way beyond Mother’s Day (so 16 February – 15 March 2016 to be exact), Red Letter Days has pledged to donate 5% from every sale of two of our most popular products – Afternoon Tea for Two at each location and 45% off Bannatyne Deluxe Choice Pamper Day for Two. 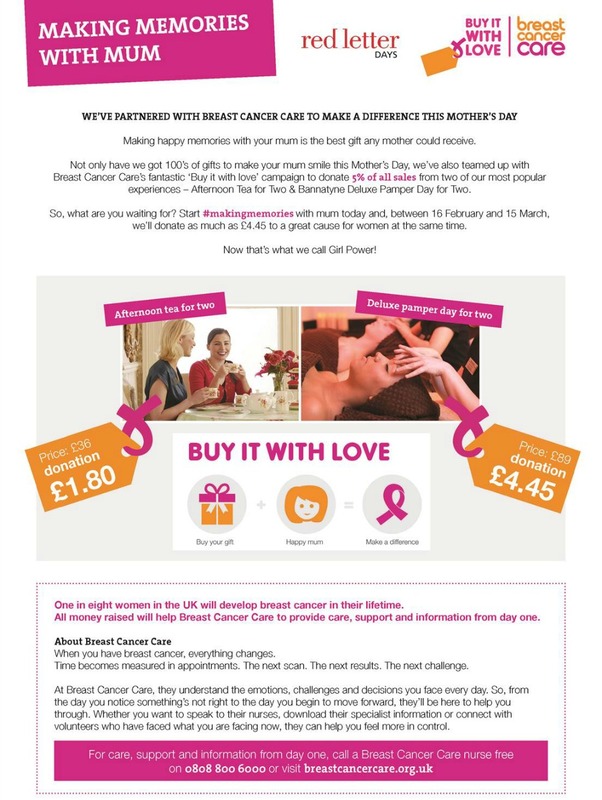 We were so impressed with Breast Cancer Care’s ‘Buy It With Love‘ campaign, we jumped at the chance to be involved. With Mother’s Day the next big occasion date in everyone’s calendar, we know our sales of afternoon tea and pamper spa days will go through the roof and that’s why we have chosen our best selling experiences for this time of year to be part of the campaign. So when you buy this year’s Mother’s Day treat, you’ll know that you are also supporting a brilliant cause.